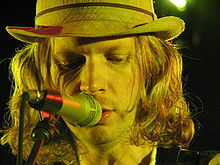 Beck Hansen (born Bek David Campbell; Julie 8, 1970), kent bi stage name Beck, is an American sangster, sangwriter, producer an multi-instrumentalist. ↑ "DanoCelebs Danelectro & DiPinto Guitar, Bass, Parts & Accessories". Web.archive.org. April 18, 2008. Archived frae the oreeginal on April 18, 2008. Retrieved July 18, 2011. ↑ "Beck". TV.com. Archived frae the oreeginal on May 7, 2008. Retrieved April 25, 2008. ↑ "Rocking the Catskills". Jews Rock. Archived frae the oreeginal on June 11, 2008. Retrieved April 25, 2008. ↑ Ancestry.com. California Birth Index, 1905–1995 [database on-line]. Provo, UT, USA: The Generations Network, Inc., 2005. This page wis last eeditit on 13 Mey 2018, at 00:17.